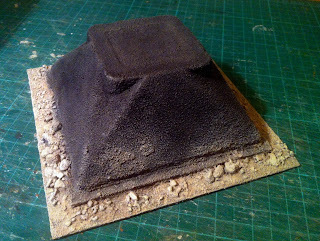 This is the final part of my attempt to turn a Co-Op coleslaw box into a wargaming terrain piece. Here are parts one and two. 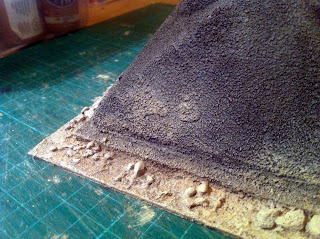 There's not much more to say about this terrain piece now, other than the paint scheme had to fit with my Afghanistan desert terrain, which you can see here and here on Flickr. One day I’ll get round to moving the Flickr images to this blog, but it won't be any time soon. I undercoated the terrain piece with Fawn and Black (the colours are the names on the paint pots) a week ago, before I went on my holibobs. On my return, I drybrushed the sand base with Medium Grey, Light Grey and Linen, and the temple with Amish Grey and Fawn. 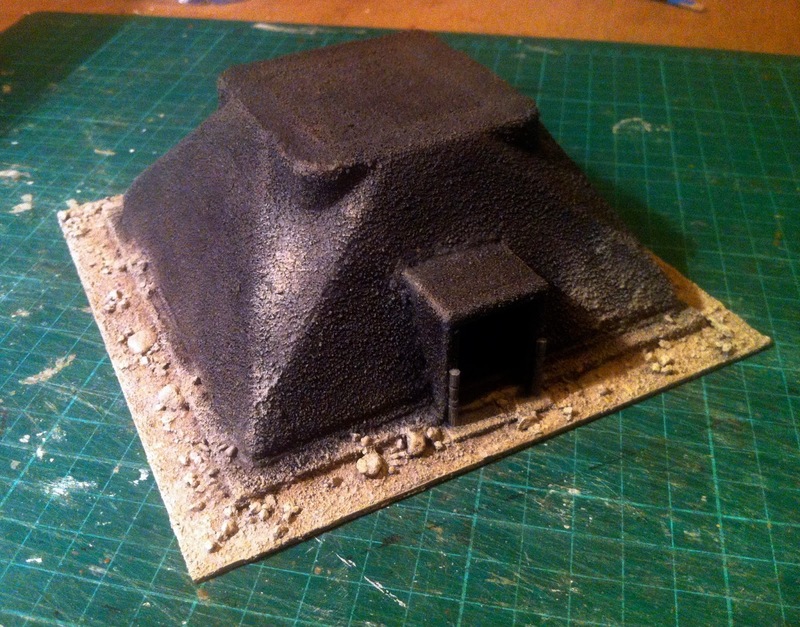 I didn't like the drybrushing effect on the temple because it was too harsh, so I added a wash of thinned Winsor & Newton Black Indian Ink which made it look more natural. 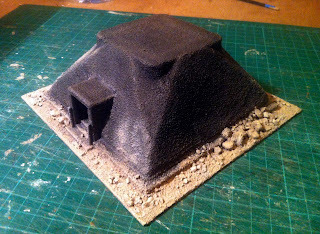 I also gave the sandy base a wash of thinned Dark Grey paint, then left everything to dry overnight. 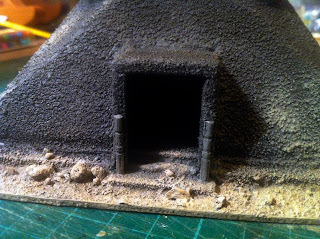 In the morning, I drybrushed the base with more Medium Grey, Light Grey and Linen, and the temple with a little Medium grey and Fawn. And that was that. 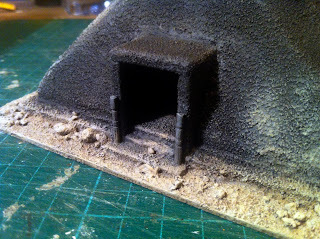 Here are some pictures of the finished item. Alas, the photos aren't great because the light today was very poor. The pillars are made with some ornate cocktail sticks I picked up from my local Chinese supermarket. I was planning to use them for their intended purpose until I spilled them all over the kitchen floor one day, so they ended up in my box of bits. Very cool, but I think I would add something, maybe a square section of floor tile, across the top. that square recess makes it look like a food container. Sorry, just being honest. You might also think about putting some sort of structure up top, to distract from the food container look, entirely. You could put a statue, or some type of antenna, or sculpture up there. That would really take it up a notch, IMO. YMMV. Cheers! No need to apologise! I don't do this for praise so I'd rather people were honest! I see what you mean about the recess – the temple does in some ways look unfinished to me too – but it was one of the draws for me. I liked the simple and clean lines of the container and it fitted with my concept of a building constructed by relatively primitive engineers a long time ago. It was also a quick and dirty distraction from a set of rules I've been writing that seem to have been going on forever.